To address this dual challenge of facing climate change and reducing poverty, the World Bank’s Energy Sector Management Assistance Program (ESMAP) has provided support to its developing country clients since 2007 to analyse the opportunities for low carbon growth. 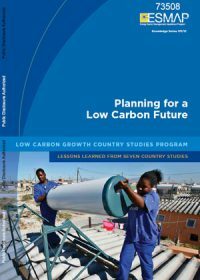 This report reviews the first group of seven low carbon development country studies conducted with support from ESMAP, most of which were completed in 2010. 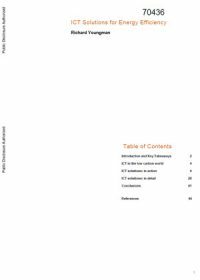 It attempts to distil the lessons learned from this work to help inform future studies while also providing an overview of the policy conclusions that have emerged. CCS could have significant impact as a carbon mitigation technology in greenhouse gas emitting industries. Given the nascence of CCS technology, with only eight large-scale integrated projects in the world (Global CCS Institute 2010), significant challenges still must be overcome for large-scale deployment, such as addressing technical issues of integration and scale-up, legal and regulatory requirements to reduce investor risk, policies to create market drivers and mitigate economic impacts, including increases in electricity prices, and financing mechanisms to facilitate investment in the technology. This report does not provide prescriptive solutions to overcome these barriers, since action must be taken on a country-by-country basis, taking account of different circumstances and national policies. Individual governments should decide their priorities on climate change mitigation and adopt appropriate measures accordingly. The analyses presented in this report may take on added relevance, depending on the future direction of international climate negotiations and domestic legal and policy measures, and how they serve to encourage carbon sequestration. Both international and domestic actions can further incentivise the deployment of CCS and its inclusion in project development. 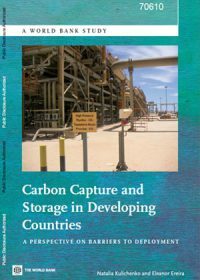 Incentives to promote CCS include adopting climate change policies that could provide revenues for CCS projects, but it is likely that a combination of domestic and international mechanisms will be required, alongside carbon revenues, to kick-start CCS project development and reduce investor risk in developing countries in particular. 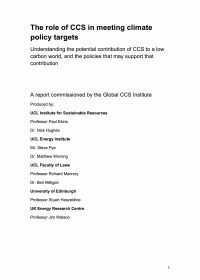 This report assesses some of the most important barriers facing CCS deployment within the context of developing and transition economies. The selection of the case studies is based on several criteria, including the level of reliance on fossil fuels for power generation and the level of interconnection of electricity networks. The case studies selected for this analysis are the Balkans and Southern African regions. Many countries within the Balkan region are considered transition economies, a status recognised as different from middle-income and low-income developing countries. However, for the purposes of this report, countries within both regions are referred to as developing countries. The report presents the results of a techno-economic modelling exercise to investigate the impacts of a number of policies on CCS deployment in the power sector in the Balkan and Southern African regions. The analysis examines the effects of such policies on energy technology portfolios in the two regions, including the level of CCS deployment, the average generation costs, the CO2 emission reductions, and the costs of the policy. Policies considered in the analysis include the introduction of a carbon price (introduced into the model incrementally at the following three levels: US$25/ton CO2, US$50/ton CO2, and US$100/ton CO2) the availability of enhanced hydrocarbon recovery, and technology-specific deployment targets. However, it should be noted that other measures that are not included in the model, but discussed in other sections of the report, could promote the development of CCS, such as government supporting policies, as seen in the United States, United Kingdom, European Union and Australia. The purpose of this report is to explore the transformative role Information and Communication Technologies (ICT) can play in acting now, together and differently. ICT has played a significant role in the last decades of improving economic productivity. It now has the opportunity to enable further significant productivity improvements, and to help transform the world to a more sustainable, lower carbon and more resource-efficient future. The bulk of the report provides case studies of actual examples of ICT solutions already developed and in action to enable energy efficiency in three particular areas – namely, smart logistics, smart grid/smart metering, and smart buildings. 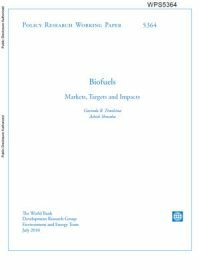 This paper reviews developments in biofuel markets and their economic, social and environmental impacts. In terms of climate change mitigation impacts, there exists a consensus that current biofuels lead to greenhouse gas mitigation only when greenhouse gas emissions related to land-use change are not counted. If conversion of carbon rich forest land to crop land is not avoided, the resulting greenhouse gas release would mean that biofuels would not reduce cumulative greenhouse gas emissions until several years had passed. Overall, results from most of the existing literature do not favor diversion of food for large-scale production of biofuels, although regulated production of biofuels in countries with surplus land and a strong biofuel industry are not ruled out. Developments in second generation biofuels offer some hope, yet they still compete with food supply through land use and are currently constrained by a number of technical and economic barriers.